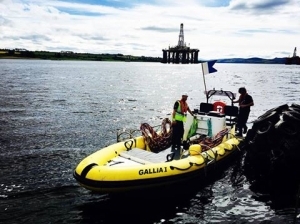 Shearwater Marine Services was recently contracted to carry out a detailed seabed survey using a team of divers, on behalf of the Cromarty Firth Port Authority. Works had to be completed prior to the docking of several offshore jack up oil platforms for planned maintenance. Jack up platforms are self-elevating mobile units primarily used by the oil and gas industry. They have a buoyant hull and movable legs, and are capable of being accurately positioned prior to the legs being ‘jacked down’ thus raising the hull well above the surface of the sea. The requirements of this contract was to survey the docking berths, recording debris with removal thereafter. An area of 10,000 square metres was mapped out and surveyed, with Shearwater’s RHIB Gallia brought in to utilise its purpose built SCUBA replacement diving and video recording systems. SCUBA replacement is a description sometimes given to lightweight, purpose built portable surface supplied diving systems. The contract was completed successfully and to the full satisfaction of the client.